The octagonal chapel is a miniature museum in itself. It can be found on the first floor of the museum. One of the most curious features of this chapel is its fake dome, composed of eight arched stretchers covered with canvas onto which painted architectural features and decorative motifs form a trompe l’oeil effect of an illusion of a Baroque dome. The five main paintings within the chapel were commissioned by Bishop Paul Alpheran de Bussan to the court painter Antoine Favray. In the late 1740s Favray worked on a set of five paintings for the chapel of the Seminary in Mdina commissioned by Bishop Paul Alpheran de Bussan. The main altarpiece here shows The Annunciation, with its lyricism and chromatic qualities, one of the most precious relics. This painting is flanked by St. Peter and St. Paul. Paintings of St. Francis De Salle, and St. Carlo Borromeo may also be appreciated by a visitor of the chapel. These paintings are signed and dated by Antoine Favray – the most prolific court painter in Malta of the Baroque Period. A small elliptical painting depicting St. Francis de Paul, by Francesco Zahra, is another magnificent items belonging to the chapel. The marble altar and flooring of the chapel was paid by the same Bishop Alpheran de Bussan. The seminary was so dear to this bishop, that he insisted that his heart be buried in its chapel. An epitaph inlaid on a marble cartouche may be seen on the right hand side of the altar. The fake dome is currently being restored to reveal the original splendour which has been veiled for hundreds of years. Caravaggio and Mattia Preti’s art on the island more or less conditioned the character of 17th century Maltese painting. Much the same was to happen during the second half of the 18th century with the arrival in 1744 of the French artist Antoine Favray, who stayed in Malta until he died in 1798, except for a nine-year spell (1762-1771) in Constantinople. His presence in Malta was destined to play a decisive role in Maltese painting that had been languishing since the death of Preti almost fifty years previously. Favray dominated the art scene in Malta in his time. His fame rests on his numerous portraits of high dignitaries of the Order of St. John, including those of Manoel Pinto, Francisco Ximenes and Emanuel de Rohan. Priors, knights, bishops, members of the Maltese aristocracy and other notable acquaintances, like the members of the Marchesi family with whom he was in close contact, were the subjects among his vast repertoire in portraiture. Apart from portraits Favray also has a significant number of religious works in churches as well as landscapes. The Cathedral Museum possesses two paintings, respectively titled Turkish Ladies and Greek Ladies, which were apparently painted as late as 1792, many years after Favray had returned to Malta, from sketches done in the East. Like Rembrandt also did in his old age, Antoine Favray devoted one of his final paintings; one of his last pages of his lifetimes diary to his own image in his self portrait. Favray painted it when he was about eighty years old and this shows how he remained artistically active till the end of his long life. Like in his other portraits he is wearing the usual fur lined coat, and also a typical 18th century periwig. 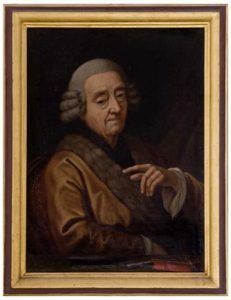 He has a rather tired expression on his face and he is sitting at a table on which there is a paintbrush and a book, what might be his sketch book. These are not being touched but instead he is pointing his index finger towards something or someone else as if suggesting that it soon will be someone else’s turn to continue his work.